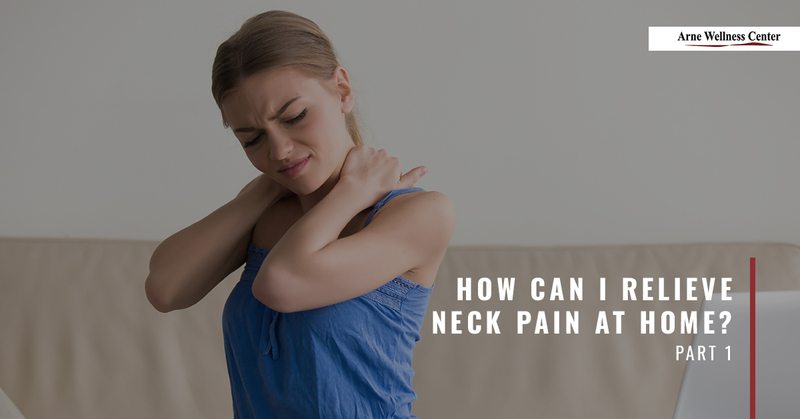 Neck pain is one of the most common conditions affecting people of all ages and occupations. If you missed our recent posts, we have spent some time exploring What Causes Neck Pain?, and Five Natural Therapies That Relieve Neck Pain. You can follow the links if you’d like to read these articles. Today, we will continue focusing on the neck by looking at ways to relieve neck pain at home. By implementing healthy practices into your everyday routine, practicing self-care techniques, and practicing mindfulness, you can not only ease pain and tension in the neck, but which can also help you avoid the onset of neck pain altogether. Additionally, self-care can enhance the chiropractic care, massage therapy, acupuncture, spinal decompression therapy you receive with us at Arne Wellness Center. If you would like to schedule a chiropractic adjustment or one of our other pain relieving treatments, reach out to your chiropractor in Littleton. In the meantime, here are three self-care tips to relieve neck pain. Ice is one of the best solutions for relieving pain and swelling. Ice can alleviate inflammation in the soft tissues that support the cervical spine that contributes to pain. Decreasing swelling can take pressure off of the spinal nerves, thereby relieving pain as a result. Try icing a sore neck for 15-20 minutes, then resting with no ice for another 20 minutes, and then repeating the process. You can use ice as much as you want, but be careful when using heat. While it feels soothing, it can aggravate and worsen existing inflammation, which can make your symptoms even worse. Taking time to stretch your neck and shoulders throughout the day can keep your muscles and soft tissues relaxed and flexible. Stretching can also help you be more mindful of muscle tension that can develop over the course of the day, which can also help you focus on practicing good posture. Light stretches might include gently moving your head toward your shoulder so you feel a nice stretch along the side of your neck, and then repeating on the opposite side. You can also gently move your chin towards your chest to stretch the tissues in the back of your neck and down into your shoulders and upper back. You can slowly rotate your head to left while your head is dropped forward, and then repeating the same stretch on the opposite side. Talk to your chiropractor about stretches that they recommend for your specific needs. Soaking in a warm or hot bath infused with either Epsom salt or essential oils like lavender and peppermint can relieve stress, tensions, and help you relax. The Epsom salts have healing properties that can soothe sore, aching muscles and joints to reduce pain and encourage circulation. These are just some of the ways to find neck pain relief at home, so be sure to join us next time for part two of this short blog series to learn even more ways to relieve neck pain. Contact Arne Wellness Center to arrange an adjustment with your Top Rated Local® chiropractor in Littleton.